The Rose Keepsake Urn is available in Sterling Silver. 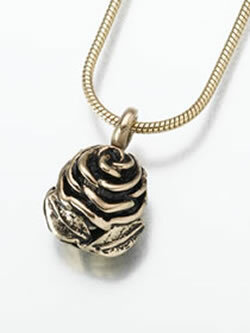 As a symbol of love and the favorite flower of many, this keepsake is for all those who love roses. The pendant measures 3/4"W x 3/4"H.
Optional Sterling Silver chains are available for an additional fee. Care and filling instructions and a small funnel are included with each pendant which is presented in a black velvet gift box.